The cover for this issue features four leaves of California Bay (Umbellularia californica) that show the tell-tale symptoms of infection with Sudden Oak Death disease, in the form of the fungus-like eukaryotic microorganism called Phytophthora ramorum, also known as a water mold. Photo by Doug Schmidt. 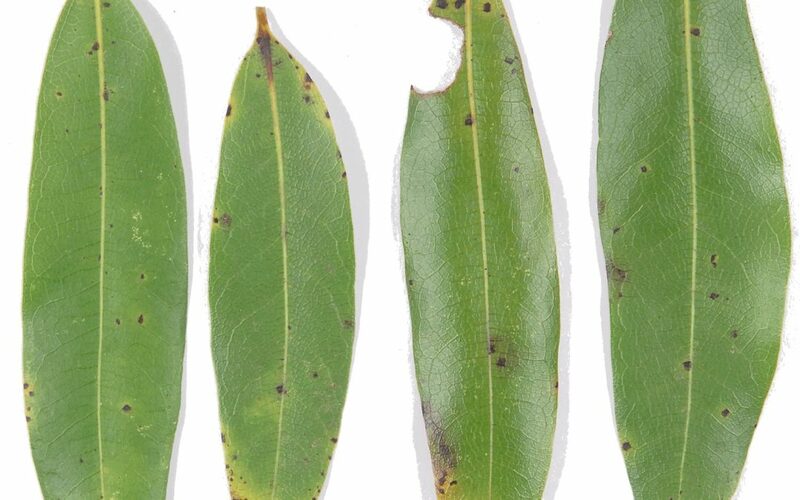 California Bay is the ‘Typhoid Mary’ for this disease as far as coast live oak is concerned, as the mold will massively replicate in the bay, raising the risk for infection in any nearby oaks. Once infected, the chance of an oak surviving is very low. Tanbark oak is a similar source of infectious spores, but is also essentially killed by the infection, unlike bay which will continue to live and be infectious. The disease first showed up in the Bay Area and for several years had been spreading southward. 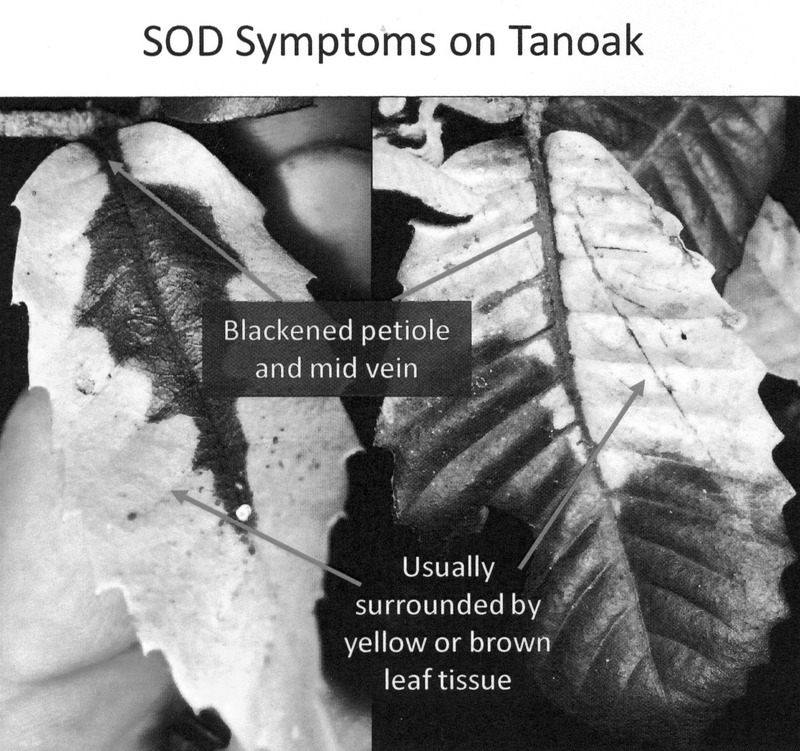 The Sudden Oak Death (SOD) Blitz is citizen science based program that includes monitoring for any trees that have symptoms, concentrating on a search for symptomatic tanbark oak and California bay by volunteers. Volunteers record suspected infections and collect symptomatic leaves which are sent to a University of California lab for diagnosis. CNPS members participated in the SOD Blitz in 2013, 2014, 2015, and 2016, surveying hundreds of trees and collecting samples, and until this year our county showed no positive detections. The analyses of samples collected during the 2016 Blitz revealed a lot of infected bay trees, especially in the Santa Rosa creek areas east of Cambria, and extending as far south as the Irish Hills. HOW DOES THIS DISEASE KILL OAKS? The infection generates oozing lesions behind the bark of an oak that cut off the transport of water in the tree. Death for oak tree may take as long as several years from the time of infection, but infection may not be visible until the tree dies (thus the name Sudden Oak Death). Tanbark oaks often succumb quickly, first manifesting wilting of leaves and branch ends. Other species such as rhododendrons and bay trees can be infected but may not be killed. Many other native tree and shrub species can be affected (more than 100 plant species have been shown to host the disease, although in some there are hardly any symptoms), but infectious spore production seems to be confined to bay and tanbark. HOW DOES IT REPRODUCE AND SPREAD? The Phytophthora group of organisms are water molds, and the reproductive spores require water for natural transmission. Water is vital to the species; the spore is motile, and can ‘swim’ in water.. Water remaining on the ends of leaves is where the spores germinate and become active. Water dropping off infected leaves or leaves dropping will carry spores to the ground or be carried by wind (especially during wet, windy weather), and it is rare that the infection will spread more than a few hundred feet unless the spores are picked up by animals or flowing water. The spores can remain in soils possibly for years. The oak species known to be infected are Coast live oak, Canyon oak, Kellogg oak, and Shreve oak (all red oaks), and white oaks such as Blue oak and Valley oak are not infected. The symptoms may be hidden for a while after infection, as the bark of the tree will look healthy and the leaves will look normal or start to have die back at the ends of branches. Cankers are spreading under the bark, gradually pinching off water flow to the crown. Lesions may appear and drip a viscous burgundy liquid that becomes runny when wetted. The liquid smells like old wine barrels. Spores do not reproduce in the cankers and won’t be found in the dripping liquid, and so oaks are not thought to directly infect neighboring trees. As the spores can be carried in leaves and in soil, soil and plant material from areas that might have the infection present should not be moved to areas with any plants know to host SOD. It might be wise to remove bay or tanbark trees if they are close to any red oaks and within reach’ of the disease. However both trees are a significant component of the local flora, and so removal should be considered only after deep thought and consultation with experts. It is also recommended that wood from dead oaks should not be moved close to uninfected oaks, and one should not export mulch from areas that have some probability of infection. SOD has been present in California since the start of the century, and much has been learned. There are two excellent web resources for more information. UC Berkeley Forest Pathology and Myclogy Lab (https://nature.berkeley.edu/garbelottowp/) is the base for new detection and the SOD Blitzes. This site has downloadable SOD detection maps that can opened in Google Earth. The maps show the locations of all samples collected in the blitzes, and the indication of SOD presence.